Today I present a watch which works on Android called" i’m Watch". Sony Ericsson demonstrated first this kind of watch with their "LiveView". The idea behind it is to connect your watch with your smartphone so handle mails, calls, messages on your hand. You don't have to put your mobilephone out from your pocket. But there were a lot of connection problems between the watch and the smartphone. The "i'm Watch" takes up this principle, but it uses Android as Operation System. Thus you solve the connection problem. Due to reports the "i'm Watch" is working fine on Iphone and Blackberrys too. 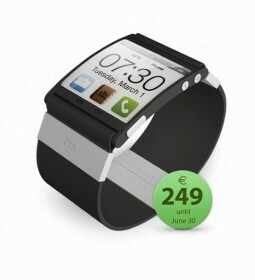 The "i'm Watch" will be able to buy in different colour on 30th Juneand and it will cost 245€ (~$345). $345? hahah too expensive! D: looks pretty cool though. This looks nice. I guess that's the way iPod Nano is gonna go as well.